So just how do you cook the perfect lasagna? Would you believe it involves BURNING it? These and many other gems and stories about life as Italian restaurateurs is what we have in store for you this week as Walter ‘Wally’ Gentile and Maria Gentile, sit around the table with Steve and Nigel and let us into the world of running their Mount Gambier restaurant for decades, along with insights into the heritage and experiences that have made it what it is today. We talk about winning national awards for pizza, for how to balance pizza toppings, motivations, people and the special privilege of being a cornerstone of a community. 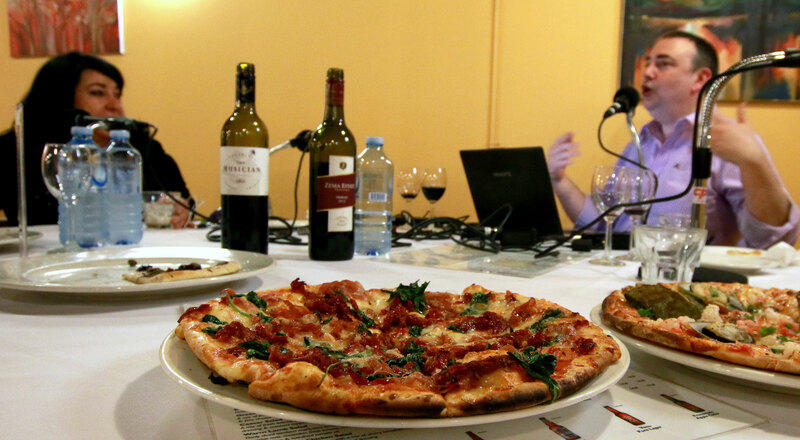 Plus, if you go to Caffe Belgiorno you can now ask for your own Adelaide Show Podcast Pizza. It is on their menu and it is superb. See the video, below, for details. We also meet patrons, Sally Pearce and Guy Detot, who met met in Caffe Belgiorno. Guy just happens to be friends with Geoffery Rush and was a friend of our late Premier, Don Dunstan, to whom we wish goodnight every week. Small world. Wine tonight – two local Coonawarra wineries – from Majella and Zema Estate. In IS IT NEWS, Nigel quizzes us on our knowledge of … Italy, Mount Gambier and South Australia. And in musical pilgrimage we have a return visit from The Baker Suite with Your Burning Lights, from their newly released album Still Life. Majella 2013 The Musician Cabernet Shiraz and Zema Estate 2012 Shiraz … Tasting notes. This week: Part Two of the series on pain and diagnosis. BONUS: Interview with Caffe Belgiorno patrons, Guy Detot and Sally Pearce, who met at the restaurant. 26:35 – Caffe Belgiorno is a legendary place in Mount Gambier. When it arrived 18 years ago, it breathed new life into the XXXX part of town. Nowadays, when anybody of any note visits Mount Gambier, from The Adelaide Crows and Port Power teams to the likes of jazz giant, James Morrison, they all put Caffe Belgiorno on the menu. 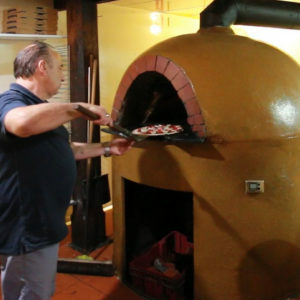 Part of that reason is the Gentle family – Walter, Maria and Anna, along with a talented crew of local young people who have cut their teeth on the restaurant game in this little slice of Italy in South Australia’s south east. And our song this week is Your Burning Lights by Baker Suite, selected by our musical curator Adrian Miller, from Radio Adelaide’s Monday night program, Songcatcher. How do you pronounce Gentile?